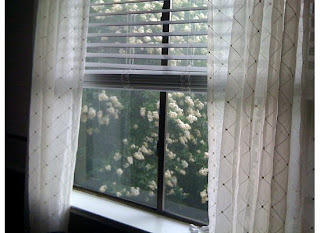 Even the Crape Myrtle outside of your bedroom window is ready for you to be here! It bloomed this week (just for you). See for yourself. I took this photo with my iPhone. Thus, the blurred image. The camera is packed for the hospital. The Crape Myrtle is beautiful. I matches the colors in Chloe's room. She really needs to get here soon!!! I know you are ready. I think we are all ready for Chloe to make her grand appearance. I bet she is ready to stretch out and sound her voice for all the family to hear. There will be happy tears of joy on her arrival.I will be with you in thought and prayer. See you next month. Bless your heart! She'll be here before you know it and you'll never remember what life was like B.C. (before Chloe!) Love you! So so sweet! Cant wait to see her! Gramma Carol is anxiously awaiting your appearance Chloe! By the way, Chloe--what's your middle name? Inquiring minds need to know. Hurry up now your Momma is exhausted, I think. Not that she won't be after you get here but at least your Daddy and Grandma and Grandpa can help cuddle you.